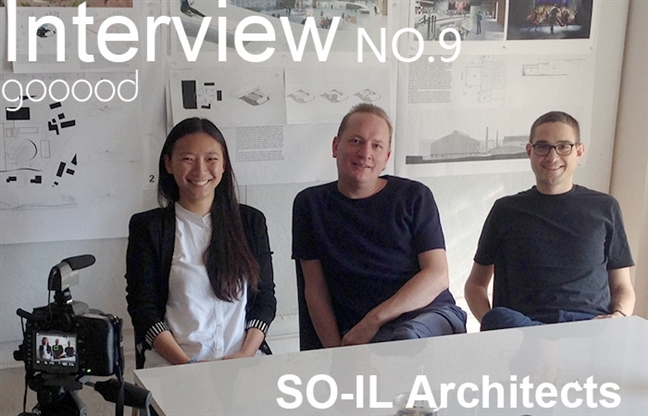 gooood Interview NO.9 introduces SO-IL Architects. So first question is why you name your office SO-IL? J: Well, originally it was because we started our office in the time of recession in 2008. But still, we very much believed from our background… Ilias is from Greece, was educated there, and then came to GSD afterwards. And Florian was studying in Netherland, and worked in Japan. And I studied in Japan and America, worked in Japan and here. So for us, we are not exactly… Even when during recession we still very much had the common that one can believe architecture need to be materialized and realized in some kind of solid form. And it’s a physical thing that’s not only limited by regulates, or theories. There is something more powerful in buildings being realized. 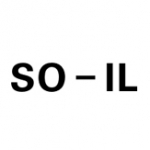 So I think the SO-IL’s objective is about having a project, an architecture project, but also materialized the object to something physical. It was an intuitive statement for ourselves. Is that related to how do you start a project? F: We always… I think search very board, go very wild, try many ideas, and through conversation and dialog and testing we come to, you know, possible directions, possible set of the ideas can be explored. But I think it’s very… as Jing is saying, it’s very essential that there is always an idea at its core. So I think you can see, between a project, some larger projects as well, some sort of exploration. Yet at the same time, I don’t see… I do think that every individual project also has an idea at its core. What is your take on contemporary architecture? Positive or negative? And how do you react to it? F: Very positive. I think, if I answer this question…every architecture that’s made today you can say it’s contemporary. Right? It’s of our time, even if the architecture is historic style, or nostalgic, or very futuristic. I think everything could be produced today is contemporary, is of our time. And so, what’s interesting of our time is that it’s so diverse, so multi-facet, so board. So there’s so many different ways of which architecture can be made. Maybe, if we look back, let’s say Modernism, everybody is doing the same thing. There’s been nobody doing anything (else) or whatever and that’s it. So, what’s interesting now I think is that there are so many different positions can be taken. So finding within that some sort of realm, some sort of definition is I think what we’re trying to do. But I don’t think we say this is the only way and everybody follows us. But it’ more trying to carve our some space within this very large field of opportunities of current exist(ence). What is your core idea of your position? F: You’re saying this is a better time for autonomous architecture? That is very interesting, actually, most of the architects today I think will declare that there is no autonomous architecture today. F: No I think if you took a practice as what Jing was saying also the idea of solid objective is that it needs to be… I think you’re always right to answer two things. One is the need, for this project to exist in this world, which you could go over functionalism or responding to the brief. As always something interpretation of what is required or requested meaning you cannot build a building or a project if you don’t answer to some extent what the person needs. So that’s one. But then, apart from answering that question, we try to answer questions within, say the field of architecture. So we didn’t say it’s autonomous space as well. So you always have to give it to two audiences or to two… you know you have to answer two questions. One is just answering the brief. And the other is answering brief to expect for yourself, which is defining a project within, I think the main of architecture itself. Whereas, I mean maybe when you were speaking about, in say some of the practices that focus on social issues or issues of energy, it seems that those are projects only answer maybe one question. I think it’s important to answer both. Does that mean in order to do two things, you need to do twice the among of work? J: Often the case. But we can only charge once. I: I think it goes back to what Florian was saying in your question of how we sort of start and work on a project. So that is this sort of overall idea or consequential objective. And then we do all these different interventions trying to find the best of form. That’s self-adopt but also accommodates the sort of functions and needs of brief. That is sort of an intense process requires a lot of repetitive studies to find the right balance basically. So is this double side idea related to your academic experience? Because I know both of you are teaching. Or in other words, is your teaching related to your practice? J: I think obviously, Florian teaches a core a little bit. But I typically do more thesis advising and optional studios. So typically that the students chose me, you know, already know what kinds of projects we are working on as a practice. So there is that kind of governizing aspects of the practice already informs a certain type of realm of academic gallery around you on the platform of teaching. And then, I think because of the context of the studio, you are able to actually push some of the ideas that have some maybe limitation, you know, economically or just kind of physical constrains in the real world that we’re practicing in our studio. And to be able to push it even further beyond those limitations and really test, you know, the validity of your ideas to a more extreme level. I think those things can inform us back to our practice that how far we can actually push these ideas in concurrently basically parallel to the studio. And I think, you know, our studio is now six years old. When we started it, we very much felt that we were the youngest kid on the block. But I think now it’s on longer the case. Recently when I faced my students I realized you know, nowadays, every two years it’s a completely new generation. The younger generation they grew up in a completely socially intensity connected world. And they see the world quite different from how I saw and how I see the world. There’s a lot to learn from the younger generations as well. And I think just engaging these conversations with our younger staff and with our students…it also keeps us confronted and active with the dialog with…just like us…what’s happening today. When you start an office, there is a lot of risk to take, so how did you guys start as an office? How do you guys collaborate as a team? J: Well, we are a very small team, so it doesn’t take too much effort to talk to each other. We just walk over… No, but we definitely… All three of us have a very kind of different way of working. But I think because we have been working for six years already together. There is a common language, so that you don’t need to basically say too many words to understand what others are thinking, what they are talking about. But there be still very much of value of the physical models as process of communication. Because even if with people who know each other so well, until you see a model in front of you together, there is a risk. And the risk is certain that what’s in your head is completely different from what’s in his head, you know, in the other person’s head. I think that’s why, I mean, goes back to what I said in the beginning about the power in the physical things. Like model is a very powerful tool for us to be able to make sure that we are talking about the same thing, you know, formally, materially, scale-wilds. You know, all those very basic elements of architecture. Model is a very good way to communicate that, even among people who know each other very well. F: So every design we worked on is very much…something in the beginning very densely… you know… worked on together in a way to identify the core idea. And then as the project moves forward, we sort of divide our efforts a little bit so that one of us follows the project through to the end. I: But then, I think it’s a little bit like a school maybe. People are independent…after the first discussion they worked independently, and then people come on together sort of present to each other, have discussions and give feedback to each other. That sense of…look like a school environment. Is there anyone always win the discussion? J: No, there is no winning or losing. We are all winners. When you look back to the past 6 years, are you guys happy with what you achieved? F: I think the funny thing of architecture is that you always have very big expectations and then you always get smashed continuously which you have to do. If you want to make buildings outside, there’s always a lot of…there’s a lot of risks that things don’t happen. Because just look at the architectural profession and the costs. And for anybody who builds something, the costs of getting somebody to design something is very little, but the decision of building something is very big. So it’s very easy to get people started to come up with ideas. But to realize those ideas, to build those ideas, that’s where the big effort lies. Both for us, and in a word, but also for clients or for people who are willing pay large sums of money to construct things. And because this time is an uncertain time, it’s very hard for people to make a long-term commitment. So we do get engaged in many many possible projects and you get very hopeful that you can realize them. And then, a lot of those don’t happen. But I think for a few of the young firm that is committed to making things, I think we’re quite exited of the things we have been able to realize, have been able to build. I: Especially I think six years for architecture firms is not that long. F: Most of buildings take five years to make. I: Maybe for a tech company, six years is a very long time. But for architecture firms, not that long time. So did you achieve all your goal? J: No, we never have any goals. We talked to some people who had their office ran much longer when we started, and then they just said, you know, it’s a long marathon. That’s gonna be up and down. You thought that you are at the top it’s gonna go down. You though you are at the bottom it’s gonna go up. Throughout the career of an architect, which is how much, forty years? You’re gonna be go through so many of that. It’s hard to have, you know, something. Whenever you have an expectation, it’s just very certain that it’s not gonna turn out that way. So we knew to not have very specific expectations. F: I think indeed if you compare with tech, or many companies, you start to compete to sell the company maybe. And then, maybe we can sell as to A Gong? or something. But that’s not our plan. So first of all, a choice of living our lives in a certain way, which is living a life from the ideas, living a life, you know, with people being enjoy around with making things we enjoying making. In that sense I think we are very happy. And fortunately we can do that, but we can do the things we like. And hopefully we can get some other people to like those ideas too, so that we can build them. But I would also say, it is very nice to see work realized. But you know, we can’t expect that for every project to happen. And it doesn’t make the ideas less valid. If you don’t mind me asking, both of you worked for SANAA before, so how do you guys think that experience related to your practice? J: I think you worked there longer, so you should that question. F: I think you can a lot learn in school. But I think you can learn more by working somewhere. I learned most by working at firms, I also worked somewhere else. I think…I worked there when I was very young, from 24 to 32. And apart from the experience of being in a completely different culture, and a completely different environment from where I went to school, I also learned how it is to, you know, make things. I think the focus there on the detail and how things get assembled, and material. And you know, that things are better when they are here, or just a little bit further away. I think are things I didn’t learn at school. And it also helped me look at things from a very different perspective because if you grow up in one system, in one philosophy, and suddenly come to completely different place, this opens up your mind. So that was for me also a very important experience to realize there are many ways to look at something, not just one way. And I think it was –able, valuable being there is that many of things I would approach in a certain way, you know, I saw different ways to look at things. And it opens up suddenly a completely new realm of possibilities. So both of the very technical, and then maybe the more philosophical way were very influential to me. Now you guys practice both in Asia and America, how do you guys see the difference of practice in those different culture context? J: I think the experience of the space is more of valued and also much of more part of the architecture…experience of architecture in Asia. And maybe that’s also something we both learned from, you know, working … I was there for only a few months. Just being in the kind of Asian context, that, you know, indeed the materiality, and the dimensions, and the architecture is not about diagram. It’s about the experience of the diagram. So it has to translate into something that people can feel, whatever the compression is, the translucencies, the light. So all that experience of the space as a concept is much more a part of the architecture. And I think here, maybe because life… the pace is much faster or maybe because architecture has more academic history to it. It’s more talking about what it needs to be. I think in Asia, it’s just how it feels. And I think that is very important. F: That’s interesting. No, I know I think maybe in Asia there is spirit in stones, right? But Louis Kahn also asks what does the brick want, right? J: But also they can’t set, right? The sun doesn’t know how great it is until it hits the side of the concrete wall. I think he has the spirit. F: Yes, exactly. He was an Eastern Europe. Do you guys enjoy practice in Asia better? J: No it’s important both. It’s important to discuss what this thing needs to be. But then it’s also important to make sure that, what it needs to be actually translate into what it is in the end. F: I do feel working in Asia there’s more courage in Asia, currently, than that is here. I think here, in general, people are somewhat more concerned or worried about future, which obviously has something to do with economic cycles, ups and downs. So I think it’s very refreshing to be in Asia and see sort of the super optimistic energy to realize things. But I think it’s also good to be in this world. So again, I think this multiple angles of looking at things is very essential to us. Last question, for the next 6 years, where do you see yourself will be? I: I think we are at a position now maybe we are getting some larger projects. But I also think at the same time, we would like to maintain sort of notion exploration and doing new things. We do want to move to larger projects but we do want to keep this sort of aspect in our works. I think the important thing for us is able to maintain the balance. Because it’s always a danger when you sort of grow to maybe sort of lose that on the way. We are discussing about that. That’s the way I think we wanna move forward. F: I think the first six years we are trying to find…like a first testing if it makes sense at all to have office. Maybe we have to go back to work for somebody. Now I think we feel we…there is a reason for us to have office. I think building the structure such to be in grow, also to professionalizing the office in a certain way while keeping the same energy and exploration as I mentioned.